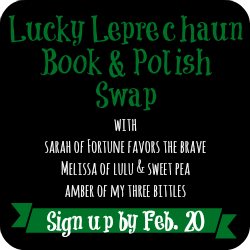 My incredibly genius friend Sarah over at Fortune Favors came up with a great idea and shared it with me: a book and polish swap. Neither she, myself, nor our other bloggy BFF Amber have participated in any swaps recently, so we decided to organize and host one between the three of us. If you've never participated in a swap before, don't worry. It's really easy and we'll help you out the whole way. If you flake, you will be called out! Please do not sign up if you aren't going to follow through! Grab a button and spread the word! The more people that sign up the better the swap will be. Get all of your book loving & polish obsessed friends to join in. Love it!! I'm totally signing up! One question - will we be able to give nook/Kindle books with a certain book in mind if that's the format that the reader prefers? I know I dislike reading on anything other than my nook now and I'd love to get my "book" in that format. What a fun idea. Can it be any kind of book? Like can it be a recipe book? Or does it have to be an actual "read"
Hey Melissa! Just letting you know we are helping you spread the word on our Swapping blog!